type="video/mp4" /> type="video/webm" /> type="video/ogg" /> Si vous ne pouvez pas voir cette vidéo, il est très probable que votre navigateur ne soit pas à jour. 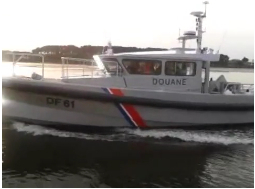 of 8 units, is intended for the patrol and State action at sea missions of the French Customs up to 20 nautical miles offshore. These 12m launches ORC 120 are built to be used for some custom controls at sea in all weathers in rough seas. These coast guard launches are UNSINKABLE. They are armed with a Custom’s crew of 4.